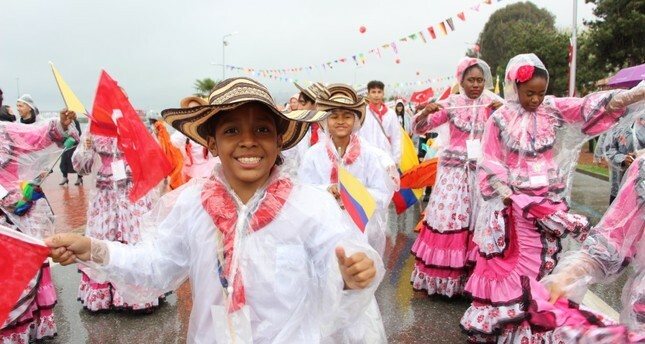 Children from various countries in a parade in Samsun, April 15, 2019. Turkey's traditional Children's Day celebrations will be held on April 23 and ahead of this unique festival, children from around the world will descend on Samsun, a northern city that will host this year's events. Children's Day was the brainchild of Mustafa Kemal Atatürk, the founder and first president of the Republic of Turkey who dedicated the day of the opening of the Turkish Parliament to children. Since the 1970s, the day, which was largely confined to Turkish children, is being celebrated as an occasion to bring children from around the world together in Turkey. Public broadcaster TRT organizes the event, which will culminate in celebrations in the capital Ankara. Some 800 children from 40 countries arrived in Samsun this weekend, and each of them will be hosted by families in the city instead of hotels. They will attend celebrations throughout the week and play with their Turkish peers while also promoting the culture and traditions of their countries through folk dance performances, concerts and things of a similar nature.